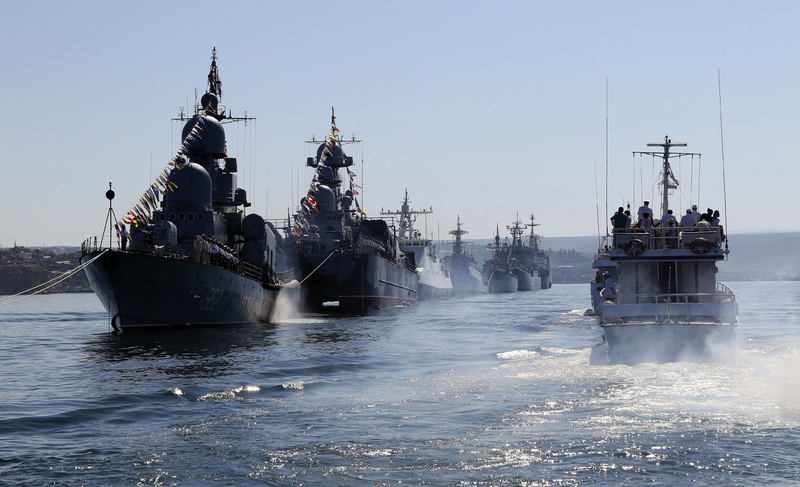 Russia has undertaken large-scale naval fleet modernization after 20 years of stagnation. Billions are being poured into the replacement of outdated vessels and building of new craft and weaponry. The challenge, however, is not easy. The Russian Navy has been conducting combat operations against ISIS terrorists in Syria since October 2015. The fight against terrorism is fast becoming one of the navy's priorities and unprecedented funds are being invested today in building new ships, bases and infrastructure. The story is not just about Syria. Moscow has for some time been aware of the need to modernize its aging fleet, which was allowed to fall into stagnation in the two decades after the disintegration of the Soviet Union. Russia invested 5 trillion rubles ($78 billion) in 2011-2012 in building new ships and submarines for the navy. Work is currently being carried out on a series of six frigates from the Admiral Grigororovich 11356 project. The Navy will soon receive the third vessel from the project. The defence industry has constructed six ‘Varshavyanka’ diesel-electric submarines from the 636.3 project for the Black Sea Fleet. These submarines are equipped with the new winged Calibre-PL missiles, which can strike targets up to 1,500 miles away. "The capacities of the new submarines were first demonstrated at the end of last year when the Rostov-on-Don submarine used its Calibres to destroy several terrorist facilities in Syria," said Igor Kasatonov, former Deputy Commander-in-Chief of the Navy and former commander of the Black Sea Fleet. Kasatonov said defence enterprises would build six equivalent submarines for the Pacific Ocean Fleet. "The industry is also building a series of strategic missile submarine cruisers from the 955 ‘Borei’ project," he said. The navy has received three of these submarines and will get another five by 2020. The Russian Defence Ministry's main resources are now being invested in modernization of submarine bases in the Far East, in the city of Vilyuchinsk in the Kamchatka Region (4,150 miles east of Moscow) and in Novorossiysk on the Black Sea coast (940 miles south of Moscow). Four subs from the 995 Borei project are headed for the Kamchatka base and four will be sent to the North Fleet docks. Three Varshavyanka 636.6 diesel subs with the Calibre winged missiles are currently on alert in Novorossiysk and, within three years, after construction of all the naval infrastructure there is complete, the base will get the other three subs from the series. Russian experts say the new programme has factored in mistakes that the USSR made in the late 1970s and early 1980s, when large ‘Krechet’ aircraft carriers from the 1143 project were introduced into the navy. The fleet got the vessels, but there was no infrastructure to service them and they were forced to permanently remain in the docks, producing electricity with their diesel engines and burning up their resources, resulting in them being written off prematurely. Now an entire set of coastal infrastructure is being created for each ship and submarine. What other ships does the navy need? "Today the navy needs large helicopter carriers, since they transport military cargo and aviation groups to areas of combat operations. Currently for Russia this is Syria," explained Dmitry Safonov, military observer at the ‘Izvestiya’ newspaper. He said one such helicopter carrier can replace an entire airbase, like the one at Khmeimim in Syria. "Russia is now working on a project to build ‘Priboi’ large helicopter carriers. It will be completed in 2025 along with the ‘Leader’ nuclear destroyer and the new ‘Shtorm’ aircraft carriers, details of which were displayed in mid-2015," added Safonov. Russia today has only one military base outside boundaries of the former Soviet Union – in Syria. "Russia does not intend to compete with America in terms of the quantity of ships, bases and presence in the world oceans," said Safonov. He believes, however, that new aircraft carriers and helicopter carriers will help Moscow project its power, like the USA, anywhere on Earth. A major problem for Russia's fleet today is absence of engines and spare parts that were earlier made by Ukrainian enterprises. Among the largest "lost" contracts is the agreement with the Zorya-Mashproekt company, located in the Ukrainian city of Nikolayev. The agreement was for supply of six turbine engines for patrol boats from the 11356 project. "Before the crisis in relations with Ukraine, Russia had received only three of the six engines. As a result, three of the ships from project 11356 will be "inactive" until 2018, when Russia will set up its own production of these engines," Viktor Murakhovsky, editor-in-chief of the ‘Arsenal Otechestva’ military magazine told RIR. Murakhovsky said one of the pressing issues is the repair of "Soviet heritage" ships and their modernization. "We have a large number of missile cruisers and destroyers of Soviet make," he said. A number of these ships are incapable of executing combat missions but they have still not been written off from the fleet. To repair them, it is necessary to construct new shipbuilding factories and expand the old ones. These projects require substantial financial investments and progressive long-term work, said Murakhovsky.